New York City dentist, Dr. Jason Kasarsky, offers BOTOX treatments to patients seeking cosmetic rejuvenation. After a cosmetic dental procedure, or if you are simply ready to turn back the hands of time, BOTOX can help smoothen facial wrinkles along the forehead and around the eyes. For patients receiving a smile makeover, this added procedure would compliment the outcome beautifully. BOTOX is a product that is produced from Botulinum Toxin Type A (or BTX-A). This ingredient, once injected, assists in blocking the facial nerve endings, which paralyzes the muscles under the skin temporarily. This allows the muscles to relax, so that the skin on the surface does not have a chance to wrinkle. Within about 5-7 days, the forehead, which is the most common injection area, will look smoother, softer, and a significant decrease in lines and wrinkles will be noticeable. On average, the results from a BOTOX injection last up to about 4 months. BOTOX injections are performed right inside our New York City dental practice. Administering BOTOX is quite simple. Dr. Kasarsky will mark the areas of injection with an erasable ink, and then apply a numbing ointment to help with any discomfort. He will inject the areas with the medication and then apply a light cold compression to help with bleeding or swelling, which is minimal in most cases. The entire procedure generally lasts about 30 minutes. There is no downtime after a BOTOX treatment. 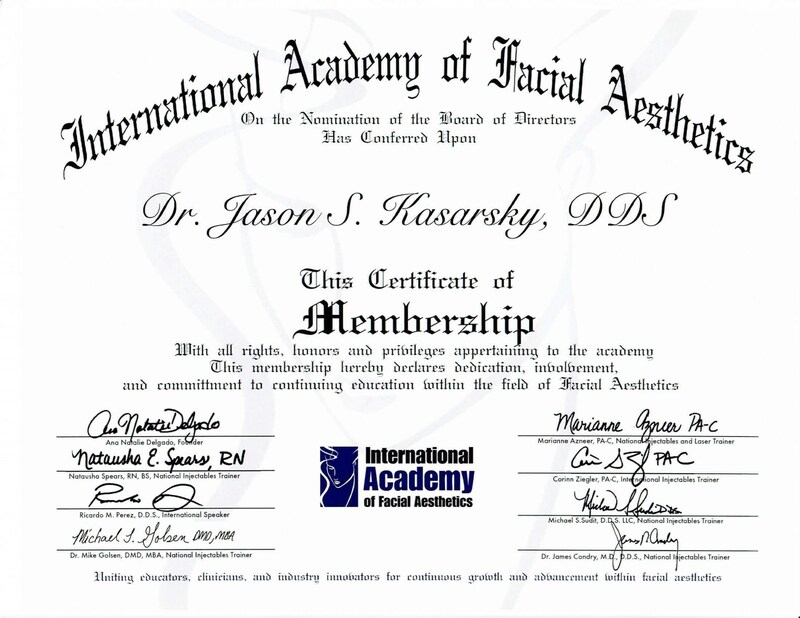 Dr. Kasarsky has completed Botox and dermal filler training. That provides the patient with the ability to reduce the signs of aging and alleviate dental ailments. He can provide aesthetic, dental therapeutic, and restorative treatment that can rejuvenate facial aesthetics and relieve pain. Immediately following treatment, patients will have some mild swelling and redness at the injection sites, but this goes away within 2-3 hours. Cold packs will be provided, which will help with the swelling. Some bruising may appear near the injection sites, but this is also short-lived, and not all patients bruise following treatment. It is advised to avoid exercise for at least 24 hours, and to sleep upright the first night after your BOTOX treatment. It typically takes about 5-7 days for the results to appear. Once they become visible, the upper face will look softer, smoother, and a significant decrease in wrinkles will be evident. Our patients love their BOTOX results and come back every quarter for additional injections. BOTOX is FDA-approved and safe to use for wrinkle treatment. When administered properly, BOTOX can create outstanding results. It is important to find an experienced injector as to avoid any complications. Too much or too less of the medication can cause an undesirable outcome. BOTOX is also used for medical purposes, including to help with excessive squinting, blinking, sweating, and migraines. BOTOX should not be confused with an injectable filler. Derma fillers are products that 'fill in' wrinkles and lines with substances such as hyaluronic acid, collagen or fat, whereas BOTOX relaxes the muscles to create a similar effect. Today, practitioners are using BOTOX for patients of various ages. Adults in their 30s use it for prevention, whereas those in their 40s and 50s use for rejuvenation and maintenance.